Mysore is geared towards students who are looking to expand their own personal practice. During Mysore Classes the student works individually, with guidance and adjustments from a teacher on the Ashtanga series of postures. Students learn to develop a self guided, flowing practice that combines breath, body and mind for both a physical and meditative experience. Students work independently, so a basic understanding of the Ashtanga system (coordination of breath with movement) and a basic understanding of self practice are required. The Mysore classes may be followed with short guided meditation and is typically offered in the morning. This class is structured around rejuvenating and healing the body. 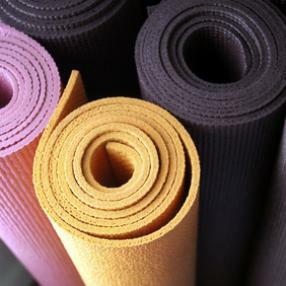 Yoga props, blankets, bolsters, and chairs will be used for a safe practice. This class approach is appropriate for those who want a softer, nurturing, slow-paced practice. The movements will include controlled pressure, well measured stretches, approaching the postures in gradual steps, with plently of time to focus on breath. The classes I teach are based upon my training in Integral Yoga®. The Integral Yoga® model was developed by Sri Swami Satchidananda and consists of warm-ups, the Sun Salutation, backward bending poses, forward bending poses, inversions, twists, standing balance, deep relaxation, and breathing, and is appropriate for the beginner as well as for those who are familiar to yoga. At the most basic level you will be introduced to your body in a whole new way, and you might be surprised by just what your body is willing to do. Hot yoga classes are done in a heated room. The room is maintained at a temperature of 95-100 degrees Fahrenheit. Based on the Bikram method this class is a set series of 26 postures, including two pranayama exercises, each of which is performed twice in a single 90-minute class. Based on the primary series as taught by K. Pattabhi Jois, this type of yoga links postures with the movement of breath bringing balance, strength and flexibility to our physical, mental and spiritual bodies. The postures are given a specific order allowing the student to create a strong asana foundation. In a Kundalini class we will practice an asana or set of asanas using a specific breath in each pose to initiate the energy to move upwards. These sets were originally taught by Kundalini Yoga Master, Yogi Bhajan. The joining of physical postures with powerful breathing (pranayama), meditation and chanting can create deep transformation for the practitioner. This is a wonderful class for students of all levels wishing to feel energized, rejuvenated and one with all. More spiritual and meditative in nature, this class will take your physical practice to a deeper level. Kundalini from an esoteric perspective can be thought of as energy. When the Kundalini at the base of the spine is opened the prana (life force through our breath) and apana (eliminative force) travelling through the pingala nadi and ida nadi meet at the base of the spine where the Sushmuna nadi originates and travels up the Sushmuna nadi channel along the spine criss-crossing and awakening each chakra to the crown chakra.